Hi lovelies! In keeping with this week's theme of re-imagining old or broken pieces of jewelry into new, wearable pieces, I tackled two birds with one stone here! 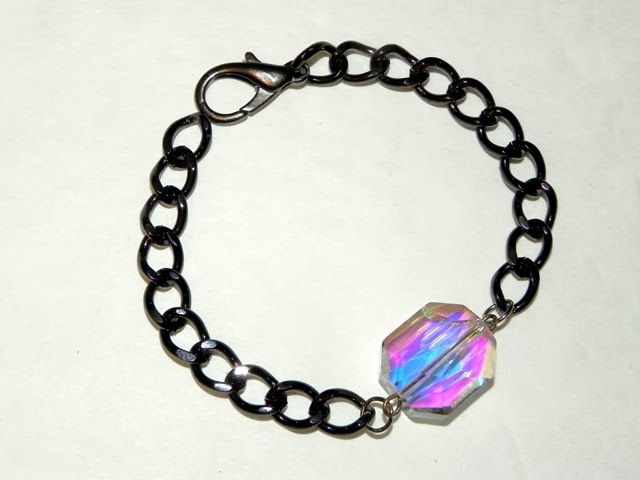 Would you believe the above bracelet was constructed from a broken purse strap (clasp & all!) and part of a lone earring? 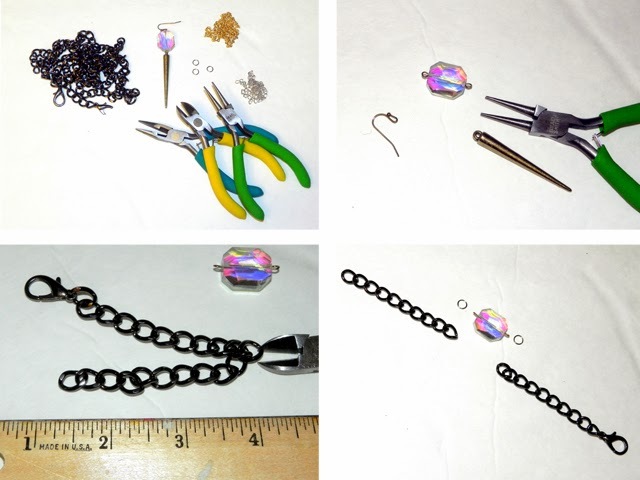 Use jewelry pliers to take apart the earring. Cut two pieces of chain about 3" each. It's easiest to use your wire cutters and pull a link apart by 'cutting' the slit in the metal that's already there. From there, use your pliers to help pull it open, like a jump ring. Attach your pretty bead with a jump ring on either side attached directly to each piece of chain. Voila! That simple! The clasp works on the chain, so there's no need to add a separate jump ring at the end to use as a closure. 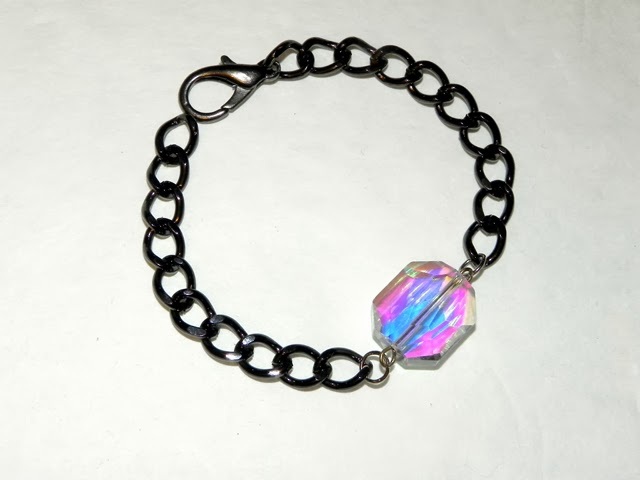 I love how fun the iridescent stone looks with the black metal chain. So perfect! Now let's use the spike from the earring and make a quick necklace with it! Extra pieces of chain you've been hoarding holding on to. If you don't have any, don't fret! 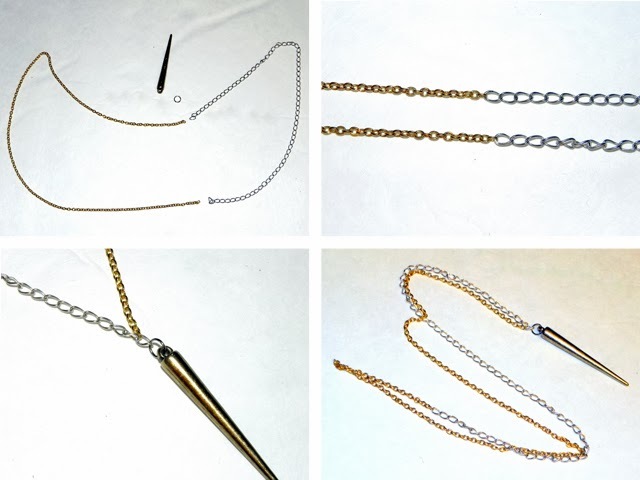 Grab an old necklace you no longer wear and re-use it! I like the look of gold and silver chain mixed, so I went with that. I also wanted this to be super long with no closure so it just slips right on over my head. If you'd like yours shorter, make sure to use a clasp! Open a link at the end of one piece of chain and attach it to the other piece. Repeat for the other side. Open your jump ring and loop on your charm. 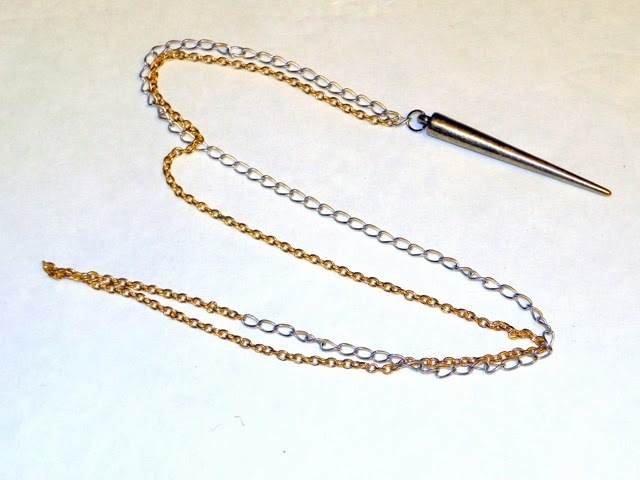 Attach it to a link on the necklace (I picked the link where the gold and silver chain meet). And the finished piece! I love the edginess of this piece, and it's so perfect for layering. I find I have tons of shorter necklaces, so this long one is a great addition. Plus, since it's gold AND silver, it literally goes with anything! As I mentioned yesterday, the purpose of this mini-series I'm doing this week is not to provide a literal step by step for you to follow and recreate the exact same pieces as I am. It's to encourage you to dig into your closet/drawers/jewelry box and pull out those pieces you no longer use and inspire you to give them a new life as something you'll love to wear! In case you missed it, here's yesterday's DIY Tortoise Gem Earrings. Marker Liquid Eyeliners ~ Under $20!